The truly frightening scenarios of total San Francisco and Los Angeles destruction in the movie San Andreas is far greater than earthquake science expects. There is already an article at smithsonianmag.com establishing this. 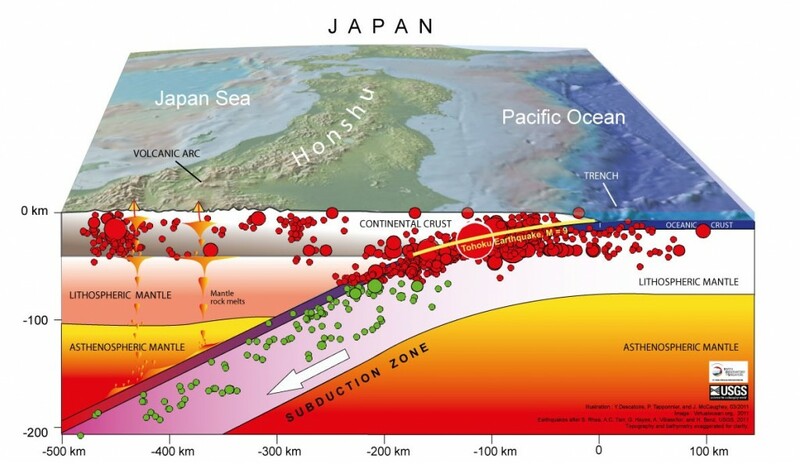 The error lies in mixing up the largest earthquakes as in Japan that result from a subduction fault, with the smaller ones along a slip-slide fault as the San Andreas fault is. The island of Japan is just West of the subduction fault where the Pacific plate, underneath the Pacific ocean, is subducting under an extension of the North American Plate or the Eurasian Plate. That can produce large land displacements. It also causes uplifting , and the water that is lifted up by it then flows back down to level as a tsunami. Being under the ocean, the plate becomes covered by sediment containing water. As that plate subducts, it heats up and the water boils up to the surface. This causes volcanoes. The island of Japan was built by the volcanoes and the subduction. The strength of the Tsuhoku earthquake in 2011 was a 9.0. The San Andreas faults is called a slip-slide fault, where the Pacific plate on the Western side is moving Northward, and the American plate on the Eastern side is sliding Southward. The leading part of the plate used to be a subduction fault that built up the Sierra Nevada. This is not expected to produce an earthquake greater than 8.0. That is a factor of 32 in energy less than the 9.0 in Japan. This is not explained in the movie. They do present the scenario that maybe a long distance along the fault ruptures at once. A rupture along the entire fault is estimated to produce an 8.3 earthquake, because it is a long fault stretching from the Mexican border, but the earthquake effects die off with distance. An 8.3 quake has about 2.8 times the energy as an 8.0. 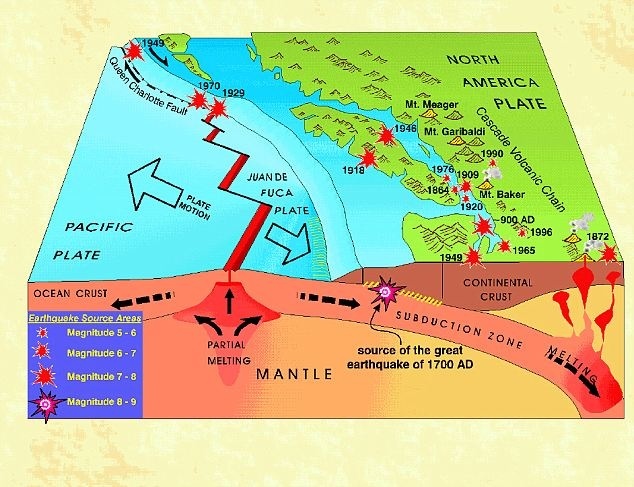 There is a subduction fault going North from Northern California, where the Juan de Fuca plate is still subducting under the American plate. This covers the coast of Oregon, Washington, and Canada. A map is below. 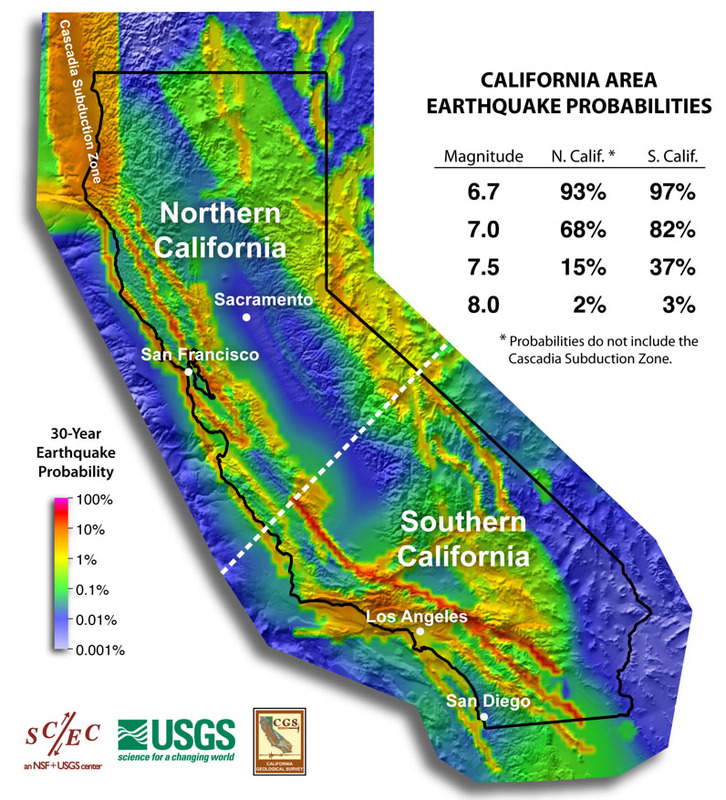 This subduction can cause large tsunamis, and that is evaluated for California ports. While some reviews of the movie claim that the San Andreas quake cannot cause a tsunami, the fault does parallel the ocean as it leaves the San Francisco Bay. Even though it is not going to subduct, any earthquake can cause a landslide into or under the water, and this can produce a tsunami (probably not the massive one shown in the movie). Block diagram of southwest B.C. showing the Juan de Fuca plate descending beneath North America along a subduction zone. 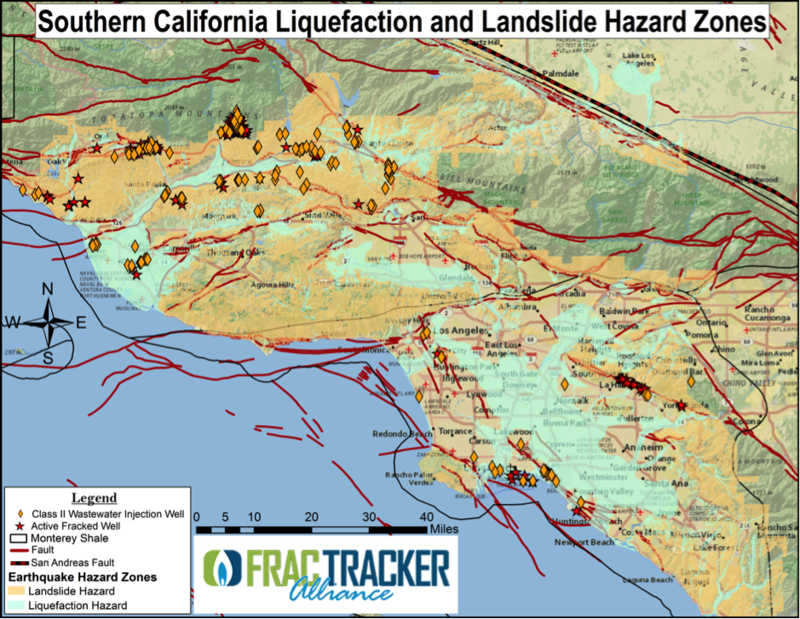 One of the dangers that the movie did not mention was the presence of liquifaction zones in places such as central LA, , Huntington Beach, and West Irvine. In San Francisco there is the Marina District and the East side on the Bay. Of course, skyscrapers are built on solid rock, but many other smaller structures are not. Another danger not mentioned is that thousands of older building in LA are built over car garages that are minimally supported at the garage level. Rather inexpensive cross beam and post systems can upgrade these to prevent collapse, as occurred in the Northridge quake. These have to be required to be updated immediately. While the movie is filled with spectacular rescues, it fails to mention the simple standard earthquake preparedness kit, such as stockpiling a gallon of water per day for each person, for as long as fresh water might be unavailable. It also recommends stockpiling food that doesn’t need refrigerating or cooking. Since people will probably be sleeping outside due to aftershocks, you also need a tent, air mats, and warm clothes. A portable radio with batteries can cover the internet being down. Earthquake and government experts are now studying the hazard that the canals carrying water to Southern California cross the San Andreas fault, and will likely be broken in an earthquake along the fault. This entry was posted in Earthquakes, Tsunami. Bookmark the permalink.